We offer a simple no nonsense refund policy for your peace of mind. Our refund policy is very simple, we are absolutely confident that you will be happy with our products and our service. In fact ,we guarantee it! 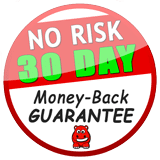 But if you are not we will give you your money back, no questions asked - our 30 day money-back guarantee has no strings attached, no fine print, no cancellation penalties etc. whatsoever. *Should you want to cancel after 30 days you can do so at anytime and we will refund you the balance of your payment, no questions asked. We give you the choice of monthly or annual billing and Red Hippo doesn't lock you into binding long term contracts, we mean to keep our customers with superb products and exemplary service, not fine print, hidden clauses and long term contracts. We keep our customers with our world class products and out of this world service. Put us to the test today and be pleasantly surprised. *The only non-refundable hosting item is your domain name as this belongs to you and is registered in your name and you take it with you if you ever wish to leave Red Hippo. Web design, development and website care services are of a different nature to web hosting and are non-refundable. *This refers to our shared hosting products and servers. Certain other products e.g. SSL certificates refund periods may vary and are indicated on the products page.